It doesn't happen all too often that I get a CD, start listening to it on endless repeat and find myself completely hypnotised by what I heard. This was supposed to be Eyston's debut release, but somehow Christopher's Records were faster with their split-7" with tVESLA (which is nearly sold out already). When I first heard about a week ago that Eyston would finally release their demo-CD, I was counting the days until I would finally get it, and it was well worth the wait. Eyston's music is terribly hard to describe, and for some people probably just as hard to listen to. This crazy three-piece (with all three guys singing/screaming) have been infected by the math/jazz/prog-core virus and although their songs are generally rather short, they add so many ideas that less creative bands would fill a whole album with. Four of the five songs are typical Eyston, meaning: complex but very organic drum patterns, very vivid bass lines and a jazzy yet distorted guitar, with structures making it impossible to follow any clear line, but therefore challenging you, being the acoustic analogue of sitting blindfolded in a roller coaster. The two songs from the split-vinyl come in newly recorded or at least newly mastered versions, while the two other songs are by no means lesser examples of Eyston's creative genius. Centrepiece is the older Ichnopurfs which has nothing in common with the regular songs. With a length of nearly nine minutes, it almost takes up half of the running time, and comes as an ambient collage, with drum machine, mellower guitar tracks and a very weird atmosphere, sounding a bit like what I have to come to like from laptop artists lately. The Yeah! 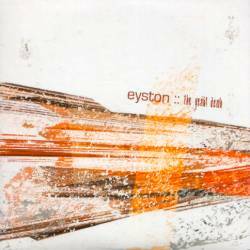 Demo may be slightly older than their release on Christopher's Records, but gives a much fuller image of Eyston's great potential. They have managed to win me over in no time at all, and with this, I declare this short masterpiece flawless, give it the maximum rating and the strong recommendation for every fan of original music to absolutely but this record.